There’s an Olympics in China this year, which is always a good time to bring out some Olympics-based merchandise. 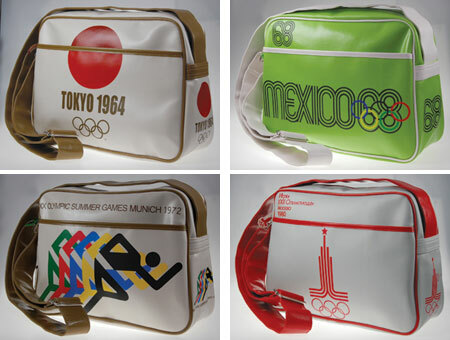 But I’m not complaining if it’s as eye-catching as these classic Olympics sports bags. All are reproductions featuring the logos of the respective games – Tokyo 1964, Mexico 1968, Munich 1972, Moscow 1980 and USA 1984 will be available to buy. The bags are made from PVC leather and are fully lined, also featuring an adjustable strap and rubber zip pull. Sized at 33cm by 24cm by 9cm, they will retail from early July for £24.95 each (although you can pre-order now). Unfortunately when I just went over to Colloco’s website my Avast warned me that it was infected with a trojan. So I thought I’d share the warning. Too bad, the bags looked really nice and I would’ve loved to check them out and see what else they have. Thank you for putting together all these retro things, I absolutely love it!